When I stopped during a recent bike ride to take a photo of a mural I saw on the side of a building, I met a very nice young woman named Andrea, who was also there photographing the mural. As we talked I found out that she had been discharged from the Marine Corps, and had moved to D.C. from Texas to go back to school. During the course of our conversation I also found out that she works at a place called Dog Tag Bakery. My initial thought was that it was probably one of those trendy boutique bakeries that makes dog treats and caters to wealthy pet owners. But when she went on to explain the background and purpose behind the bakery, I found it very interesting. 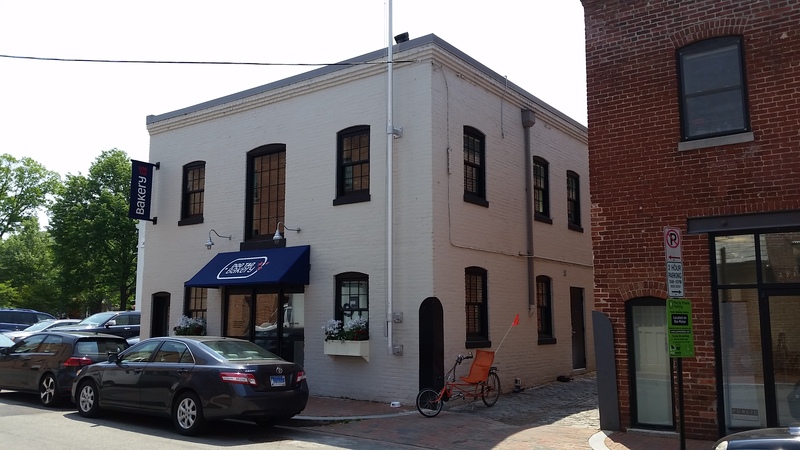 So on this bike ride, I decided to go to the Dog Tag Bakery, located just off Wisconsin Avenue at 3206 Grace Street (MAP) in northwest D.C.’s Georgetown neighborhood, and check it out for myself. While it might seem like the idea behind the bakery is to sell delicious baked goods, the Dog Tag Bakery is really all about giving back to those who have served in the military. The bakery is just a storefront for a larger program run by Dog Tag Inc., a nonprofit organization founded by Rick Curry, a Jesuit priest and adjunct professor of Catholic studies at Georgetown University, and Connie Milstein, a successful attorney, real estate investor, entrepreneur and philanthropist. The program utilizes baking and running a bakery business as a way to help ease the transition of entrepreneurial-minded wounded veterans returning home from Iraq and Afghanistan, and their spouses, back into civilian life by providing an innovative training program and leadership development opportunities. The Dog Tag Program is made up of courses that are tailored to the business focused goals of the participants. The courses include accounting, principles of management, communication, corporate finance, marketing, business policy and entrepreneurship. Participants who successfully complete the six-month program earn a Certificate of Business Administration from Georgetown University’s School of Continuing Studies. 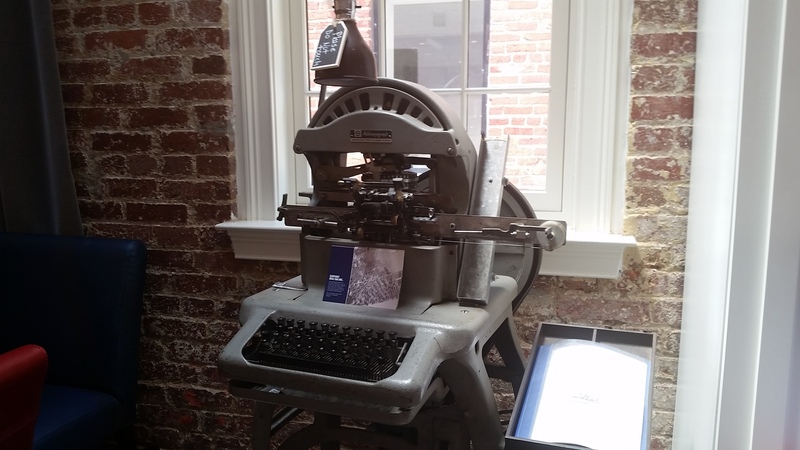 Dog Tag’s Grace Street facility not only contains the bakery and storefront, but a classroom and office space as well. It also contains a stage, which is where veterans participate in occasional spoken-word events in which they address audiences about their experiences as part of their training in communication. 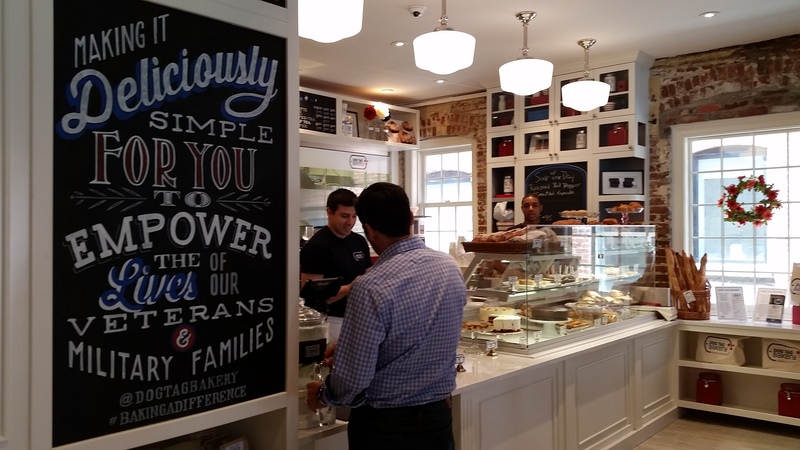 Not to be missed if you stop by the bakery is the chandelier that hangs above the stage. 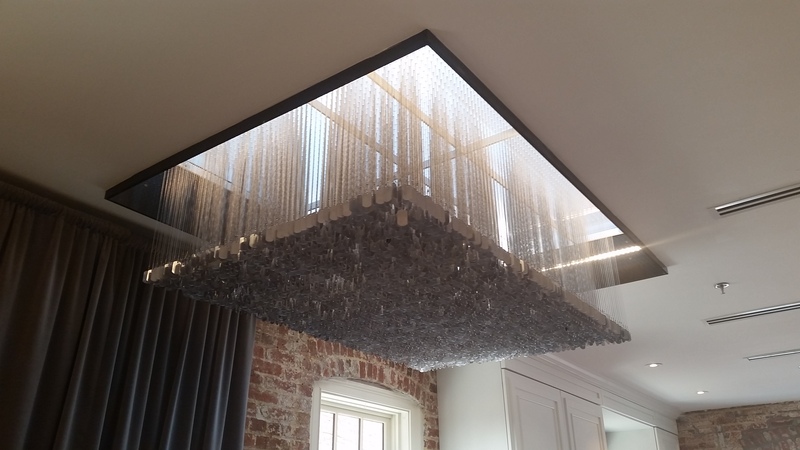 The Dog Tag chandelier is made from 3,456 individual military dog tags. The unique display is intended to honor all the servicemen and women. Second only to the graduates the program produces, the Dog Tag Bakery also produces delicious baked goods. Open Tuesday through Sunday from 8:00am until 6:00pm, their menu not only includes a variety of breads, cookies, brownies and pastries, but breakfast and lunch items as well. The breakfast menu includes items like breakfast sandwiches, fruit cups, a parfait with yogurt and homemade granola, or a veggie fritatta. However, I stopped by for lunch. Having to choose among the various sandwiches and salads on their lunch menu was difficult, but on this ride I chose was the Turkey, Brie & Cranberry Mayo on fresh-baked Honey Wheat Bread. The softness of the bread combined with the moist, flavorful turkey combined with the sweetness of the cranberry mayo was perfectly complimented by the saltiness of the sea salt kettle chips they served with it. I splurged and also got a slice of carrot cake for dessert. It was moist and perfectly spiced. It is a nut free bakery, so there were no walnuts in the carrot cake, which was to my liking because I prefer it without nuts anyway. I also got some mini quick bread to go. They offer banana, cranberry and pumpkin spice. I chose the latter. Although I have only been there once so far, everything I had was delicious, and everything else I saw looked equally appetizing. So I’ll be going there again soon, and I recommend that you do the same.